Well, it’s happened. Every year tomatoes in Kansas suffer through one onslaught of disease, destruction, and disaster after another. (Okay, it’s not that bad, but I just couldn’t resist the alliteration!) Now that the weather has turned hot and humid, following a period of rainy weather, tomato diseases are starting to come out of the woodwork! There’s our first sign of early blight, and a stellar sample it is, too! This is on our Brandywine tomato plant (dratted heirlooms! ), near the bottom of the plant. Also of interest, notice that the leaf shape for this plant is more like a potato than a tomato. That’s because Brandywine is a “potato-leaf” type of tomato. Typically we see either Early Blight or Septoria Leaf Spot (or both at the same time) show up right about now. 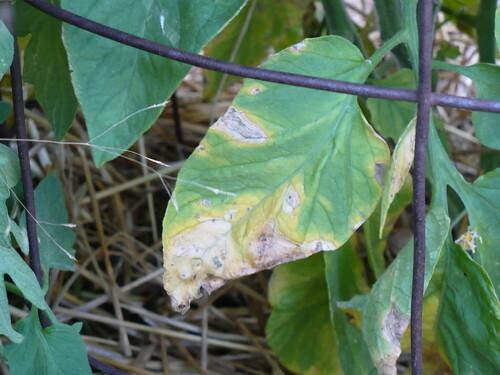 The Early Blight is distinguished by the triangular yellowing with lesions that frequently have concentric circles in them. Septoria, on the other hand, is characterized by yellowing and lots of little black spots. In fact, the above leaf may have a few spots of Septoria on them as well. Most gardeners first notice the bottom leaves of their tomato plants turning yellow and then brown. The diseases come from the soil, get splashed onto the lower leaves by rain or irrigation, and then work up the plants. We always try to mulch our tomatoes to prevent some of the disease problems. Drip irrigation, tomato cages, and appropriate spacing of the plants helps too. We usually try to pick off diseased leaves, and then the last resort is spraying. We haven’t sprayed anything yet. If you want to, you can use Chlorothalonil. Organic options include a copper-based fungicide, biologicals like Actinovate that are Bacillus subtilis or other bacteria that feed on fungus, or do nothing. Some years doing nothing works just fine, other years it can be disastrous. Of course, it’s hard to tell that before it’s too late! Posted on June 23, 2010, in Plant Problems & Diseases and tagged plant diseases, Tomatoes, vegetable gardening. Bookmark the permalink. 2 Comments. This is my second year for raised bed gardening. Last year one of my tomato plants had what I believe is the Septoria. By the time I figured out what it was, the plant was so infected, I pulled it to protect it from spreading any further to the other plants. I treated the other plants with copper and that worked pretty well. Now this year, all my tomato plants have it. They are planted in a different bed – I understand I shouldn’t plant tomatoes in the same bed for three years. I started out just pulling off the lower leaves but it’s worse than ever. I put on a second application of the cholorothanlonil just this morning. My poor plants looked scalped though since I’ve pulled off so many infected leaves. I was hoping to maintain an organic garden so I was reluctant to use the spray. My question is, will any of the foliage grow back if I can get a handle on the Septoria? I put on an application of Miracle Grow last week. Do you think that will help? With so little foliage left I’m afraid the tomatoes will burn up. Should I consider putting burlap over the cages to help shade them? My cages are made of cement wire so they’re tall. I have eight plants in an 8×4 foot bed. I use soaker hose covered with wheat straw. Here’s what I don’t understand about the water spashing up theory. I have several volunteers in last year’s bed. They look great and don’t seem to have the blight and I usually water them from the top with the hose. Your plants might put on some new leaves…tomato plants are very resilient! You are right to be concerned about sunburn on the tomatoes though. The biggest concern with these diseases is the loss of photosynthesis from the leaves with a close second being damage to the fruit from lack of leaf cover. If you start seeing problems with the fruit, a little light shade might be in order, as long as you don’t shade the whole plant. I see where you’re coming from with the water splashing theory. The disease causing organisms are known to overwinter on plant debris (usually in the soil) or on weeds, but sometimes it’s hard to figure out why some plant are affected and others aren’t. (You should see me trying to explain why one lawn has brown patch and another doesn’t!) In your case, maybe the volunteers have better air movement? Gardening is surely always an adventure!